The journey is very long and slow: over 7 hours and, depending on which train you catch, much of it at night. The trip across the Causeway from Johor Bahru to Woodlands Singapore together with the two customs and immigration stops adds to the journey time and can be frustratingly slow and tedious. The train itself is fiercely air-conditioned and uncomfortably cold. Facilities on the train are basic. 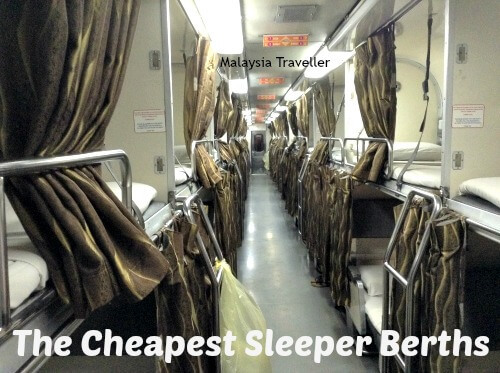 Here is a review of my recent Intercity Kuala Lumpur to Singapore train trip (and back). You will note that the train terminates in JB Sentral (in Johor Bahru, Malaysia). From there you have various options to make your way to Singapore (see Crossing the Causeway below). Again the train starts at JB Sentral. You have to get from Singapore to JB Sentral first. You can find the full timetable, including arrival and departure times at intermediate stations, on KTMB’s website. 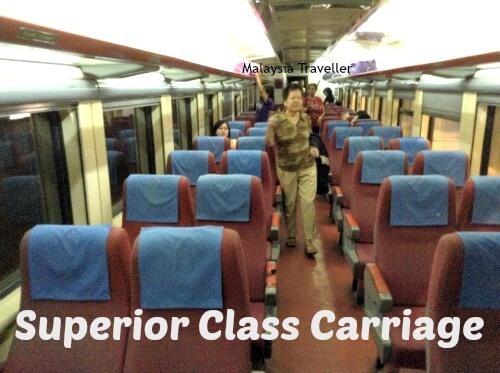 For regular seating there are three classes; Premier, Superior and Economy. I went on Superior (RM33) and returned on Economy (RM18) and there is almost no difference in standard of comfort except that the air-conditioning in Economy was even more freezing than in Superior. 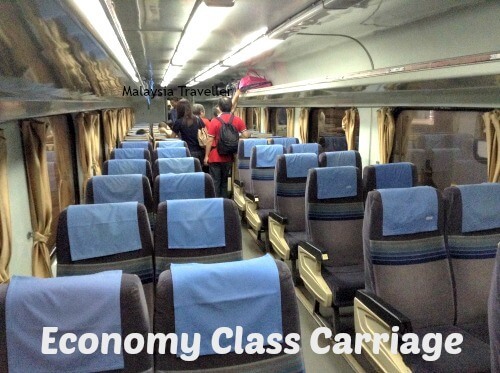 Premier class has plusher seating and is more spacious, configured three seats across (two on the left of the aisle and one on the right) whereas Superior and Economy are four seats across. In Superior and Economy there is no middle arm-rest so not great if you are travelling alone and are seated next to a stranger. Sleeper berths are popular so better to book well in advance, particularly if you want the best sleeper cabins (Premier Night Deluxe Class). The best class of sleeper cabins have their own private toilet and sink but everybody else has to use the communal toilets situated at the ends of each carriage. They are fairly basic as you can imagine but at least toilet tissue and paper towels are provided which is better than most public toilets in Malaysia. You may have a cafeteria coach on your train which sells simple meals, snacks and drinks (non alcoholic). 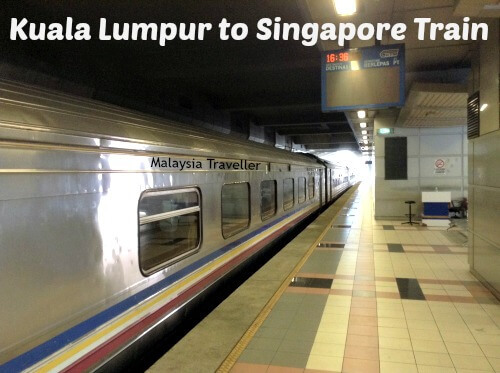 The Kuala Lumpur to Singapore train has lengthy stops at some stations (up to 15 minutes) giving time for passengers to get off, warm up and for smokers to light up. As an alternative to booking through KTMB's website, you can also buy tickets online through BusOnlineTicket.com. Click on their advertisement below to get started. The most painful part of the journey to Singapore is crossing the Causeway which divides the two countries. The train terminates at the modern and spacious JB Sentral station in Johor Bahru. Passengers wishing to proceed on to Singapore have to exit JB Sentral through a series of pedestrian walkways and escalators and enter the adjoining Customs, Immigration and Quarantine (CIQ) Complex, also known as Bangunan Sultan Iskandar. More escalators and corridors lead you to the Malaysian Immigration counters where you have to get your passport stamped for leaving Malaysia. Then you have to cross the Causeway (bridge) itself and you can either take the train known as Shuttle Tebrau to Woodlands ( a 5 minute journey) or a bus (journey time depends on traffic conditions but long delays at peak times are normal). I was planning to take the Shuttle train but did not realise that they get booked up 28 days in advance as the service is mainly used by workers doing their daily commute to and from Singapore. So I had to take the bus (many bus operators to choose from) which took about 30 minutes to reach the Woodlands (Singapore) side of the Causeway where you have to disembark and be processed at Woodlands CIQ. More queuing at Immigration counters (you even have to fill in an arrival card) then baggage X-ray before descending to the bus platforms to find your bus for the next onward stage of you journey in Singapore. When returning from Singapore back to Malaysia it is the same tedious procedure in reverse. Of course if you take the long distance coach from KL instead of the train you still have to go through the double CIQ hassle. Even if you are driving your own car, there are long queues to cross the Causeway. Next time I go to Singapore I think I will fly to save the bother. The extension of the Electric Train Service is continuing. 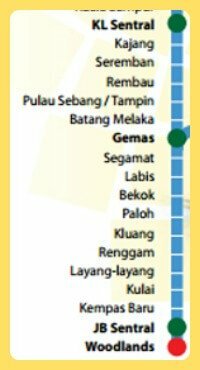 Already the ETS runs as far south as Gemas (as at March 2016) and the plan is to complete it all the way to JB Sentral in the coming months. When completed the journey time will be reduced and there will be more frequent trains. Further into the future is the planned High Speed Train from KL to Singapore, a bullet-style train which could reduce the journey time to just a couple of hours. This project is still at the advanced planning stage so I imagine it will not happen for another 5 years or so.